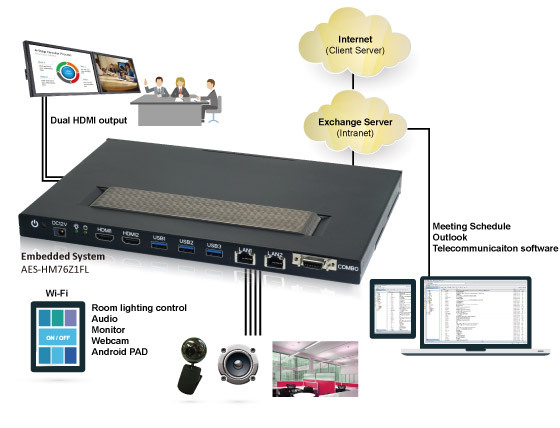 The Acrosser Technology has announced their newly build a fan-less and ultra slim embedded computer system, the AES-HM76Z1FL, specialised for conference management hardware. It will support multiple commutation platform and software such as Google Hangouts, Skype, Web-Ex, Blue Jeans, and GoToMeeting that ideal hardware for partnership of media solution. This device let the conference attendees to join the meeting with their own devices. The flexible system connectivity architecture concept is to eliminate hardware restrictions and promotes multi-lateral communication in an economic yet efficient method. By simply connecting a tablet computer, the participants will instant have a control dashboard to change room settings and manage room resources. The AES-HM76Z1FL supports Intel Ivy Bridge CPU with HM76 chipset with a memory of 2 x DDR3L-1600MHz, SO-DIMM, up to 16GB, support SATA III and CF storage. The serial ports of the device are RS-232 and RS-422/485. It also have HDMI/VGA/USB/Audio/GPIO output interface and 2 x GbE, 1 x SIM, and 1 x mini PCIe(for 3G/WiFi). These are the great specification of AES-HM76Z1FL.